A Slice of Life: Have you sent your Christmas cards already? Have you sent your Christmas cards already? Advance Merry Christmas everyone!! Do you still send Christmas cards by post mail or e-cards are just ok for you to send? Hay naku! 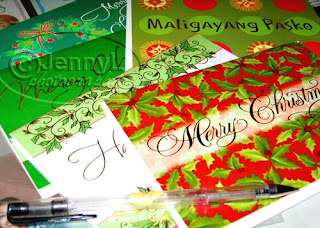 Aabutin na naman ng next Christmas ang Christmas cards ko for this year. Hehehe! Love sending cards thru post. Love receiving them too!